With the first successful democratic transition, Pakistan seems to be moving towards a situation where democracy could find stronger roots. However, this does not diminish the significance of the Pakistani Army and the ISI in the country’s decision making apparatus. Decision making in Pakistan is alluding and fragmented. Each regime either military or civilian has had varying approaches. In the following paragraphs, an attempt is made to analyse the decision making during the Pervez Musharraf regime using the 1999 Kargil Conflict and the subsequent coup deposing the Nawaz Sharif government. The theory proposed by Allison and Zelikow in their book Essence of Decision: Explaining the Cuban Missile Crisis revolves around three models. Primarily, the Rational Actor model has its basis in realist school of thought. It explains decision making using the concepts of rationality, interest, choice and consequence. 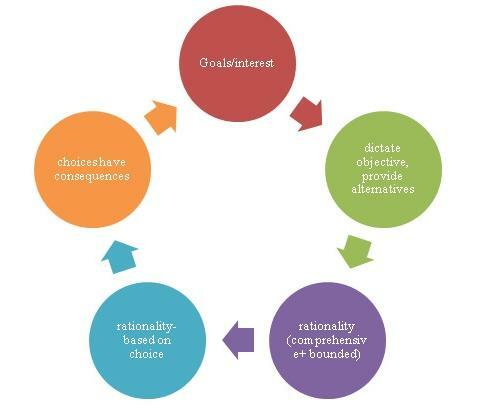 This model perceives the government/nation as a unitary actor. The model stipulates the goal as maximisation of national interest and security of the state. The decision to achieve that goal can be broken down into actions, alternatives and consequences. The definition of rationality specified within this model is debated in two ways- comprehensive and bounded. The use of either or both throws light on the ultimate decision. The understanding culled out of the first model can be depicted as a ‘cycle of rationality’ represented diagrammatically below. Model II is centered on the organisational behaviour. It analyses decision making from the organisational prism wherein the state or government is an organisation which follows specific standard operating procedures (SOPs) which shape policies. Organisational cultures and routines contribute towards unified action and maximise capabilities linking Model I and II. When viewed from model II, decision-making involves the state machinery working as an organisation to avoid uncertainties following ‘rational’ consistency. Model III focuses on ‘personalised’ power and is called Governmental Politics. The actor in this model is an individual focusing on decision making from the position of power (leadership, authority in apex organisation). ‘Where you stand depends where you sit’ forms the crux of model III. Thus, all three models operate simultaneously as seen in the following case studies. Several controversies surround the Kargil conflict. Debates as to whether it was a war, mini-war or a conflict continue. The fact remains that it occurred following a peace dialogue between the two countries. The stakes were high as both nations were nuclear states following the 1998 tests. The decision making for conducting the conflict can be analysed using model II and III. The strategy followed by Pakistan in the Kargil conflict was in keeping with previous routines of asymmetric warfare and pre-emptive defence. Analysis of the varied literature regarding Pakistan’s Army Chief Pervez Musharraf’s decision to launch the conflict suggests parallel signaling by the army in opposition to the friendly strides being offered by PM Sharif. Also, the use of Northern Light Infantry (a paramilitary force later inducted formally into the Pakistani Army) from the Force Command Northern Areas (FCNA) areas is in keeping with prior conflicts centered on Kashmir. The organisational culture of the FCNA forces varies from the rest of the Pakistani army due to constant pressure it faces in retaining posts across the Line of Control (LOC). This organisational culture resulted in the NLI occupying more territory than originally planned, thereby transforming it into a larger crisis. Furthermore, information on the organisational culture of the army, the motto of which is ‘protecting the ideological and territorial frontiers’ adds to the complexity of analysing Kargil from model II as elucidated below. The Kargil conflict can be analysed from the prism of model III too. The planning of the operation, the secrecy maintained among the ‘Gang of Four’ indicates the personalised process of decision making. For example, the DGMO at the time was unaware about the operation, while a lower level officer Lt Gen Javed Hassan in charge of the NLI, strategised to occupy large chunks of territory which could not be retained. The operation was kept as a secret not only from the civilian government but also from many important people in army. This secrecy depicts fissiparous individual centric decision making. The ambition, interest and bargaining games further abide to model III’s application. This analysis forms the basis of understanding the 1999 coup. The takeover by Musharraf from PM Sharif mainly resulted from the unpopular decision of the latter to withdraw forces from Kargil. 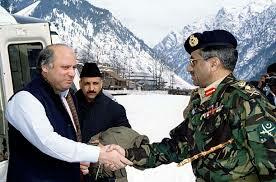 Seen from the ‘seat of power’ motive, the retaliatory coup launched by Musharraf against Sharif personifies model III. 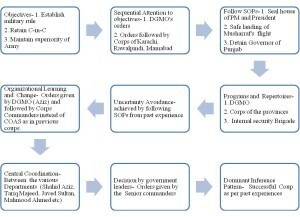 Furthermore, the changes in command made by Musharraf before he left for Sri Lanka- appointing loyalist Brigadier Salahuddin Satti as commander to the 111 Brigade, who was in charge of Prime Minister’s Security and ordering the military intelligence to track Sharif’s movements, can be viewed from lens of Model III. 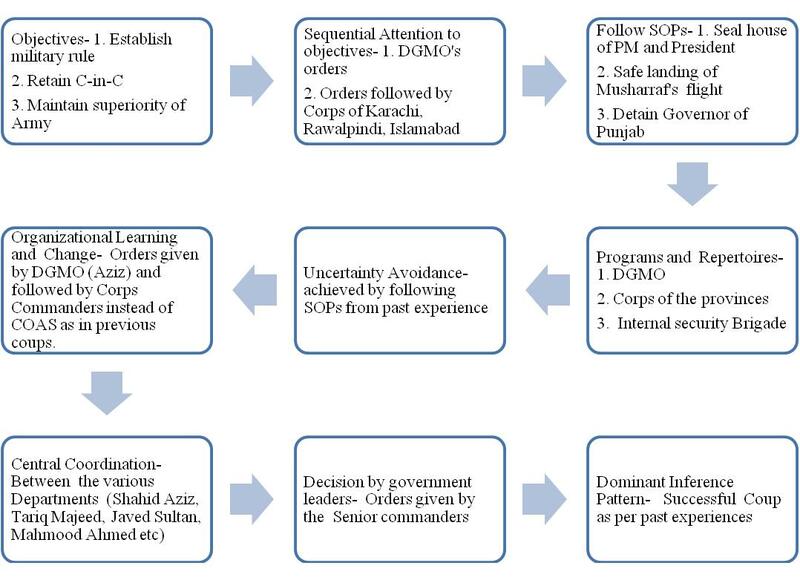 However seen from model II’s perspective, even in the absence of the COAS, the army followed the SOPs and protocol from previous coups ousting Sharif’s government as shown in the figure below. The removal of General Jehangir Karamat by PM Sharif had not gone down well with the powerful Pakistan Army. Since the Kargil conflict was seen as a success by the army, the actions were defended by Musharraf with the blame for its failure being placed on the shoulders of the civilian government, particularly Nawaz Sharif. The organisational reaction to Sharif trying to replace Musharraf resulted in a takeover by the Army. The deeply set organisational culture coupled with self-serving benefits of the higher officers involved in the coup depicts how model II and III operate simultaneously in the decision making process of the Pakistani Army. The decision making in Pakistan appears to be twofold. Firstly, the historical, traditional and cultural norms that guide the larger reasons for taking a decision which the organisational behavior model explains; and secondly, the decisions being guided by a specific individual’s approach to power. The second aspect can be seen as Musharraf’s choice to go ahead with the Kargil operation (Model I), the output of that was the Kargil infiltration (Model II) and the outcome was the 1999 coup (Model III). The segmented power structure, the operational approach of these powers, the embedded culture within the power institutions can be analysed through the three models resulting in better understanding of complex decision making in Pakistan. I would like to thank Prof. S Chandrashekhar for helping me understand the theory and provide insightful feedback. The overall analysis could not have been made without his guidance. I would also like to thank Prof. Rajaram Nagappa, Head, International Strategic and Security Studies Programme, NIAS for giving me the opportunity to do my summer internship at NIAS. Many thanks to my guide Dr. Arun Vishwanathan, without whose support I could not have completed the paper. I would like to thank my department of International Relations and Geopolitics, and Prof. Arvind Kumar for giving me the support and encouragement in writing the paper. Ramya PS is a Master’s student at the Department of Geopolitics and International Relations, Manipal University. She also interned with the ISSSP, NIAS. She can be reached at: ramya[dot]panuganty[at]gmail[dot]com.